Our large 2-room apartment is conveniently located in the east of Nuremberg in the district Mögeldorf in a quiet side street. A short walk leads to the nature reserve Pegnitztal, where you can walk, jog or cycle. The large Nuremberg Zoo is right next door. Just as short are the routes to the city center (about 10-15 minutes), the fair or the airport (car about 15 minutes, with S-Bahn and subway about 30 minutes) and the highway (about 5 minutes ). A short walk will take you to the S-Bahn, which will take you to the main station in Nuremberg in just 6 minutes, and thus to the city center and historic old town of Nuremberg. There are other means of transport such as bus and tram / tram available as alternatives. Shopping, restaurants, gym (McFit), parks, Tiergarten and children's playgrounds are nearby. Free parking in front of the house. Our newly renovated and modern furnished apartment is located on the ground floor, is 48 square meters and has a large living-dining room and a separate bedroom. The kitchen is fully equipped (fridge, electric stove with oven, dishwasher, coffee machine, kettle). In the apartment there is next to the bedroom with double bed (140x200cm) also a sofa bed for two persons. A travel cot for toddlers is also available. TV (German channels) and free Wi-Fi are available. The bathroom is equipped with shower, vanity and toilet. Bed linen and towels are provided. The apartment is ideally suited for a city break, holidays in the region, trade fair visits and business trips. Families with children are welcome (P. S .: The beautiful Nuremberg Tiergarten is right around the corner and the Playmobil Fun Park is only about 30 minutes away ... and there are countless activities for families with children of all ages nearby). You are welcome to ask for conditions for longer rentals. 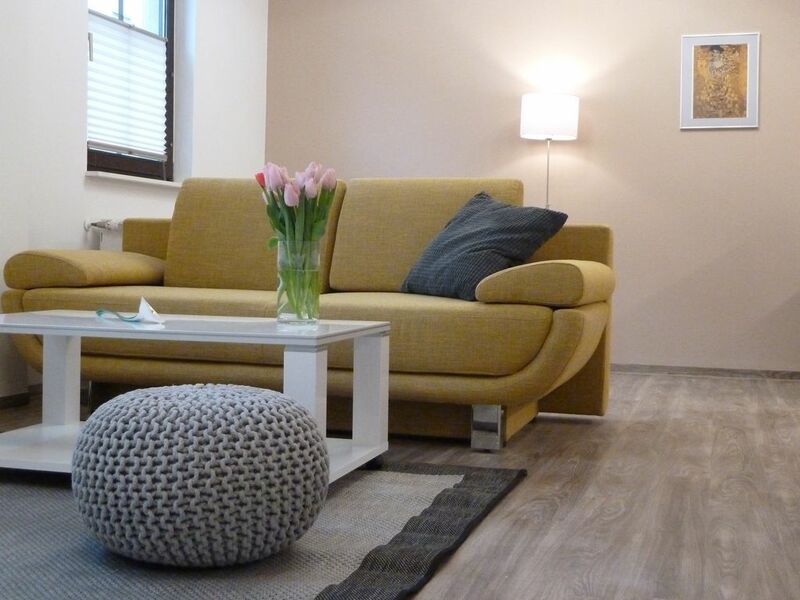 Our big double-room apartment is located in the east of Nuremberg in a quiet area in the suburb called Mögeldorf. A short walk takes you to the river Pegnitz and a large nature protection area. The great zoo is just around the corner. The way to the main station and the city center is just as close to the apartment. With the public transport you can reach all sights and places in a short and frequent way. Shopping facilities (supermarket, pharmacy, bakery), restaurants and a park with a childrens playground are near our location. You can park your car in the front often he apartment for free. The apartment is new renovated and furnished. On 48 sqm you will find a large living room with a kitchen area, a separate bathroom (with a shower) and a sleeping room. There is a double bed in the sleeping room (140x200 cm) and another posibility to sleep on the sofa in the living room. There is also a baby cot available. The kitchen is well equipped (fridge, stove with backing oven, coffee maker, dishwasher, kettle). TV with german programs, free WIFI. Do not hesitate to call me for further questions! Great apartment in a quite part of town. The hosts were a very nice a helpful family. I loved the apartment and location. Convenient grocery and shopping right across the street. Ottimo per trascorrere una breve vacanza. Appartamento super e proprietario persona squisita.Semplicemente fantastico. Grazie Giuseppe, sono contento che siete stati nostri ospiti. Granzie per lasciare l´appartamento cosi pulito e ordinato. Tutto il meglio e forse ci vediamo. Sehr schöne Ferienwohnung und gute Lage zur Erkundung der Umgebung, das Bett war uns allerdings etwas zu hart. Sehr schöne Wohnung mit super Lage! Die Wohnung ist sehr nett eingerichtet und in der Umgebung findet man alles was man braucht. Auch die Anbindung an die Stadt ist sehr gut. Danke für die Bewertung. Es freut uns, dass Sie die Zeit in Nürnberg genießen konnten. Perfect location in the eastern city area. Quickly to the city center by public transport, car or on foot. By train or car fast and uncomplicated in the beautiful regions of the Franconian Switzerland, the Nürnberger Land, the Steigerwald, the lake region or to neighboring cities such as Bamberg, Regensburg or Würzburg. Perfect located in the east of the town. With public transport or by car a short way to the main station, city center, fair or airport. Nuremberg and other cities like Würburg, Regensburg or Bamberg.